I’ve never read any Anne Tyler before, but I was lured into buying this book by a dramatisation I heard on Radio 4. Over the period of a week or two I’d often catch few minutes of the show and find myself wondering what had happened in the episodes I’d missed. The curiosity got the better of me and I treated myself to a second hand copy from Amazon. 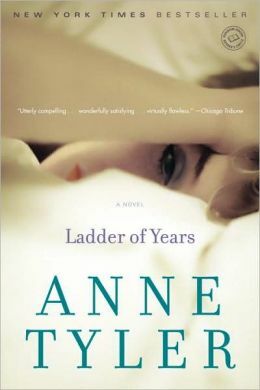 In Ladder of Years Anne Tyler tells the tale of Cordelia ‘Delia’ Grinstead – a forty-year-old housewife and medical secretary, who, while on a seaside holiday with her family, walks off down the beach and doesn’t look back. This all started on a Saturday morning in May, one of those warm spring days that smell like clean linen. Delia had gone to the supermarket to shop for the week’s meals. She was standing in the produce section, languidly choosing a bunch of celery. Grocery stores always made her reflective. Why was it, she was wondering, that celery was not called ‘corduroy plants’? That would be much more colourful. And garlic bulbs should be ‘money bags,’ because their shape reminded her of the sacks of gold coins. Ladder of Years is a thoughtful book, one of those stories that will make you wonder at the significance in every small thing. If Delia had not been shopping in that particular store on that morning, or if she had spent a little less time musing over the celery, her life might have taken a very different route. It is in the produce section that Delia meets Adrian Bly-Brice, the man, the catalyst, who would set her on the first un-Cordelia Grinstead journey of her life. The question of why Delia decided to leave her family is a difficult one to answer. Mainly because she didn’t, decide to leave I mean. She never intended to leave her family, it just sort of happened. It is as though she was overwhelmed for a moment, fed up with being so predictable, and once she had started walking it was difficult for her to find her way back home. Who is it that Tyler hopes the reader will feel compassion for? Is it Delia? Or with the family that she has left behind? I felt a strange mix of feelings for both parties; coming from a broken family myself I empathised with the family left behind in Baltimore, who had lost their mother completely without warning. She upped and left without the slightest hint, leaving all her belongings behind, these things are never painless or easy. It must have been horrendous for her children, no matter what their age. I also felt sad for Delia, who seemed so lost and confused, spending the first days of her absence crying herself to sleep. She didn’t even fully understand why she had left. I feel as though Delia was going through some sort of midlife crisis. She is portrayed as silently struggling to deal with the recent death of her father, who had been the one constant figure in her life. When her children began to grow up, she had reverted to caring for him, and months on from his death she could not bear to clear out his bedroom. It remained stuck, in a sort of time trap. Then she began to doubt her reasons for getting married and second guess her husband’s feelings towards her. Feeling as though she had never been swept off of her feet, by a man like Adrian Bly-Brice, but then, as her twin nieces would say ‘well that’s life’. For this reason, I felt hopeful that Delia would find her way home. While few physical events actually happen in the book, it is in the least bit boring, and the chapters do not drag. The journey is predominantly an emotional one, and as such no single event seems to stand out as that important. That said, the Delia Grinstead who emerges throughout the book is a very different woman to the one who puzzled over celery on the very first page. Tyler’s impeccable writing style allows for this emotional journey to take shape. The whole world in which Delia inhabits is so clearly defined that it might be about to leap off the page. All thoughts are portrayed seamlessly, and with almost perfect attention to detail, through Delia’s eyes. Each time she meets a new person, is faced with a new situation, or does anything at all, it is as though you can see the cogs of her mind working. The faces of the people she meets unfolding before her, in such a way that everyone becomes incredibly rounded and 3-dimensional. I feel as though I could sit and sketch an image of every person in the book, from Delia herself, to the fleeting image of Rosemary Bly-Brice. I feel as though I have spent a couple of days reading an incredibly articulate diary. Not too much happens in the grand scheme of things, but I was definitely drawn into Delia Grinstead’s world. This one was an easy book to get into, and an even easier book to finish. Eloquently written, but without a hint of snobbishness. Again…I am peeked by the mind of Delia….I guess I am always curious about how a person’s mind resolves daily and difficult situations in life….enjoyed being made curious about this book’s contents.